This week’s Interview is with none other than 2 x World Champion and Grand Slam Champion, the amazing Queen B, Bianca Walkden. Our chat starts off with what every athlete should be thinking about, Hopes and Goals for 2018. Bianca has had a great year in 2017, I ask how she finds competing so often and does she peak for certain events or just try to maintain a high level of conditioning all year round. Then it’s onto what point in her life she decided to become number one in the world of taekwondo. Hobbies, does Bianca have time for anything other than Taekwondo? What motivates Queen B is it standing on the podium or are the cash prizes up for grabs the driving force to keep her winning- I’m sure we can all guess the answer but let’s hear what Bianca has to say, what truly motivates her. The next question is about social media, her youtube videos, Instagram stories etc. With the brand Queen B out there on hoodies, kick pads, t-shirts and also splashed all over social media is this what she does to relax or does she enjoy getting her brand to the followers. We chat next about SPOTY (Sports Personality of the Year) and who she was sitting next to did she enjoy the experience, and how does she feel knowing she is inspiring the next generation. As a successful player for Team GB, we chat about who we should be watching coming up through the ranks from children up to juniors and if the future looks bright for GB. 2020 was next on the questions to be answered- has she been to Tokyo before and importantly does she hope to represent GB and take some Gold home? We ask Bianca what a regular day in her life is like, then onto rules in tkd is there any she’d love to change and why. What’s after competing for Bianca, some of the old fighters now coach on GB, will she coach or maybe open a performance centre??? We all have good luck charms, things we do at competitions, what’s Bianca’s take on the whole “good luck charms” does she have one and if so what is it and why. We chat about the love of her life Aaron Cook and how she felt when she first met Aaron and also what they chat about after training- is taekwondo off the agenda or is it what they eat sleep and chat about. Lastly, we asked Bianca the same question we ask all our guests…. what makes taekwondo different, and also what it takes to be a black belt. 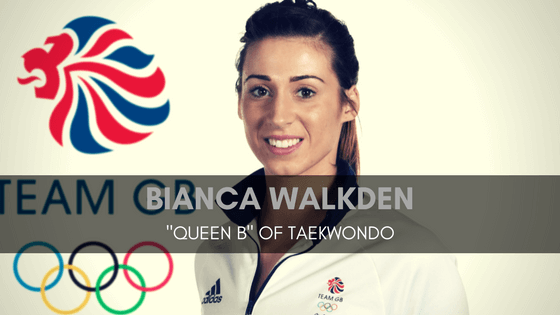 I hope you fun listening to the podcast with the Queen B of taekwondo Bianca Walkden. remember if you like this podcast please subscribe, like and leave a comment on iTunes. If you want to connect with Bianca here are her social media and website links below. I am fairly certain I’ll be informed a lot of new stuff right here!